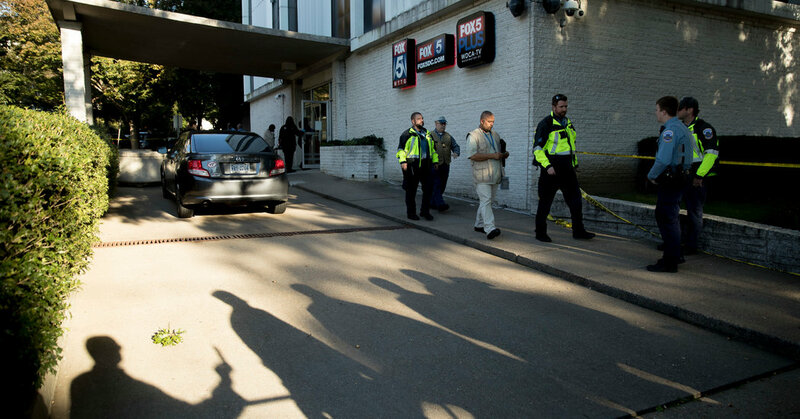 WASHINGTON – A security guard shot and wounded in a man on a local television station, Monday, stoking renewed fears that journalists have become targets in a highly polarized political environment. The guard fired her weapon, the man in the torso. The man was not armed, the police said. Nobody else was injured. The police said the man was not allowed to go to a police station, said Dustin Sternbeck, a spokesman for the Metropolitan Police Department , 38, whom they declined to identify, what conscious and in a stable condition when he was taken to a hospital. Mr. Sternbeck said. The police said they were interviewing witnesses and reviewing the video 5 broadcast. The shooting at the station comes almost four months after a man stormed a newspaper at Annapolis, Md., And opened fire with a shotgun. The suspect, Jarrod W. Ramos, had filed a defamation lawsuit against the newspaper and sent hostile messages directed to the paper's reporters on Twitter. He was charged with five counts of murder. President Trump condemned the newsroom shooting and offered his condolences, but he has often portrayed the news media as the "enemy of the people." After the shooting, the publisher of The New York Times, AG Sulzberger, said in a statement in a private meeting that his "language was not just divisive but dangerous." But Mr. Trump has kept up his attacks. At a political rally last week, he praised a Republican congressional candidate's assault on a reporter last year. "Anybody that can do a body-slam," the president said, "that's my child of guy."